Runcam just released a new version of the Swift FPV camera – The Swift 2. I am lucky to get a sample, and in this post I will be going through some of the improved features and provide photos of the product. Here is the overview of the changes and improvements from previous versionf, and unboxing of the Swift2. The original Swift has been one of the most popular FPV camera out there, with the Swift2 Runcam has added some really cool features.. Yes, the Swift 2 can now display your battery voltage on the screen! Simply by connecting the battery’s positive to the VBAT pin on the camera. This eliminates the need for an additional OSD (such as MinimOSD) if all you ever use are voltage and timer. If VBAT isn’t connected, it can display the camera’s input voltage instead. But this will result in ~0.1-0.2V lower in readings than the actual voltage due to the voltage filtering circuit. The Swift 2 has a built-in Mic for Audio. It’s located on the back of the cam so wind noise is minimized. Input voltage supports 5V, up to 36V officially, but the range is actually wider technically in both directions. This ensure the camera can survive more hostile voltage spikes during punch outs or throttle changes. I was told there is also input voltage protection to further improve the electrical robustness of the Swift 2. Finally users can choose lens of different FOV, options available are 130° (2.5mm), 150° (2.3mm) and 165° (2.1mm). Apart from the standard single hole housing, it also comes with a spare, 3-hole case, as well as a spare back plate without the “ears”. This made it compatible with many more frames out there. The holes in the housing are now threaded, allowing you to fix the angle better. The Swift logo is printed on both top and bottom of the housing, but the words are oriented the same direction so you won’t get confused which side is up. Camera lens focal lengths (FOV) is printed on the lens for easy identification. Furthermore, he Swift 2 performed better than the previous version in the Latency Test, for about 6ms faster. The camera comes with the following parts as shown in the picture. There are 2 silicon insulation cables, one 3-pin (if you don’t use Audio and VBAT), and the other is 5-pin. 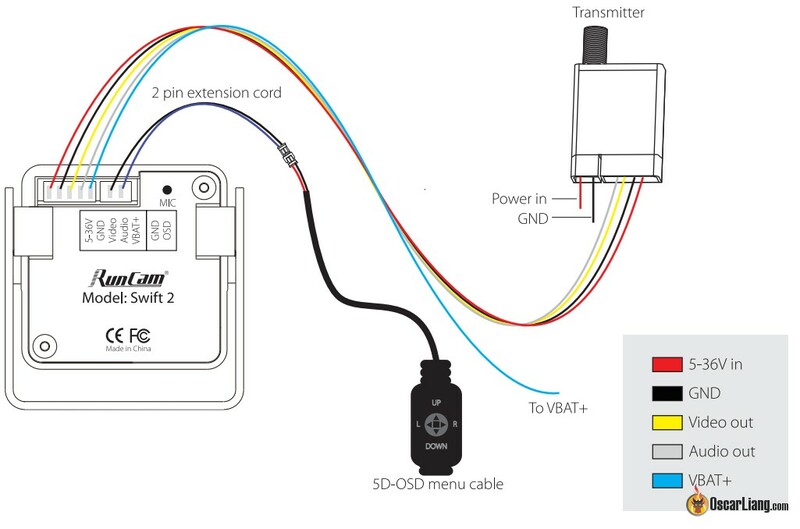 Here is a connection diagram provided by Runcam, between the camera and OSD control (for camera settings), VTX and battery. Here is the manual leaflet that comes with the camera, for my future reference. One thing I really wanted to see is if they’ve made the core stronger than the previous Swift, so let’s take it apart and find out! So far it looks great, the sensor is glued down, and there is no more dangling crystal (silver cylinder). I haven’t got the old swift with me, but I have the Rotor Riot Edition, which is essentially the Swift with some minor changes and different lens. Here are some side by side comparison of the 2 cameras. Hi Just installed the swift 2 micro on my quad and I’m flying with the default setting. My problem is when I face the sun, the video goes dark. I was racing with my friends and I had to skip some parts of the tracks since I cant see where I was going. Is there a way to fix this in the menu? Please I need help. Thank you. I have a swift 2 and the picture is good. But when i am pointed the sun the picture is really darkness. Hey Oscar, wanted to thank you for all your info and work. It makes getting into the hobby much less painful for a beginner like me. Is there a way to focus the runcam swift 2. I just installed a brand new one and the picture looks very out of focus. I have tried twisting the lends to focus it but it doesn’t budge. Thanks for any help you can offer. There should be a ring on the lens thread, twist that ring further towards the lens, and then try to fit the lens in the camera. Get a good focus, then turn the ring back toward the camera until it’s too tight to turn. I have a Betaflight AIO FC. When using a RunCam Swift 2 I can not get my Betaflight OSD to appear even though I turned off all the OSD on my RunCam. I switched from NTSC to PAL in Betaflight and still the same results. I hope that you can help me. I look to your page before I go anywhere else to do research and appreciate what you do. I solved this issue today on my quad. When you switch to PAL, the aspect ratio changes. So before switching enable the OSD features you want, place them all in the center of the screen preview, and then switch the format so that you can place them on the screen where visible. Betaflight even shows a live preview on your goggles as you move them around. If you can help me ! I have connected a swift 2 on a F4 pro v2 omnibus board. The OSD Betaflight no longer appears. I switched off the camera’s OSD and still nothing. When I come back on a Swift 1 camera, I have the Betaflight OSD again. If you have a solution to have permanently Betaflight OSD ? This is more likely to be a NTSC/PAL setting in betaflight. I believe you can change it in Swift 2 menu too. Thank you, that’s it ! this post is quit old but i had the same problem and i fixed it (at least it worked with my swift 2). I pluged in the osd control thingy for the swift 2 and powered up (lipo + usb dont know if thats part of the trick). thats all the betaflight osd appeard. I have the Rotor Riot Camera can I connect vbat to the (5-17v) pin of the camera? The Rotor Riot cam is exactly the same as the swift 1 with a GoPro lens. You can, but it won’t give you OSD voltage reading. It’s only to power it. For the Vbat do you just connect that to any + lead on the flight controller or PDB that is not a BEC? I am running the FuriousFPV Radiance with the X-Racer Quadrant. as long as VBAT is connected anything that is also connected to battery you should be good to go. Both foxeer and runcam keep changing the dimensions with each new camera making them this way incompatible with most frames. Frames that use side plates to mount the camera instead the awful aluminium mount will have hard time to use the new cams. For example the swift is 28mm width and the swift2 is 28.5mm, bah. How does this compare to the arrowv2 with OSD? How’s the image? Does anyone know if the sensor board of the Swift fits into the Swift2 case? I stripped plastic where the screw theads in, on my Swift. I’d rather order the new case as replacement due to the metal thread. Is there a way to calibrate the voltage, mine is showing about 0.2v or 0.3v lower than actual voltage. FYI The OSD menu is entered by pressing up for 2 seconds not the button. I was getting a bit frustrated until I figured this one out. How do I get to the setup menu? Would love to hear from others if they have found the need to adjust ANY of the settings from factory default to get better overall results when flying in most situations in daytime. Just received mine and for the most part it seems the factory settings are for the most part the most ideal in most cases. Agreed? At the moment there is nothing we can do, and it’s not possible to calibrate it. Swift with a microphone!!! Gimme! Is there a release date yet? It can be pre-ordered now and it will be shipped on 9, Jan.